Congratulations to Elizabeth, the winner of Kat's giveaway. Thank you to all who participated. People often ask me what my writing day is like. Since I’m a workaholic, most of those days are long and mentally exhausting. I thought it might be fun to tell you what my perfect day would be. Aside from a day in Paris or Rome, or some other exotic location, I had a perfect day last week. 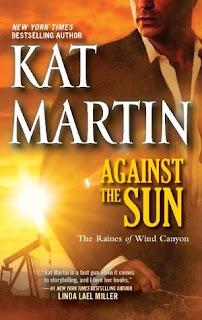 I did a little book promotion for the latest in my AGAINST series, AGAINST THE SUN, which is out May 28th, then went back to work writing the book that comes out in January of next year (AGAINST THE ODDS). I worked straight through until five o’clock in the afternoon, writing and enjoying the view of the snow-capped mountains outside my window. It was one of those days where everything just seemed to fall together. Great writing days don’t happen that often so authors value them highly. I felt tired when I wrote the last scene of the afternoon, but happy with what I’d produced. Because it was the first truly glorious day in Montana after a long cold winter, my husband and I decided to go on a camera safari. We loaded some snacks into the pickup and headed up into the hills. In one afternoon we saw three herds of elk, hundreds of deer, three groups of sand hill cranes, osprey, Canadian geese, ducks and woodpeckers--it was an animal lover’s dream. Add to that, scenic mountain vistas that stretched as far as the eye could see. As it started to get dark around nine p.m. (we’re already getting long days this far north), we headed for the only food available for miles--Trixie’s Antler Saloon. Yup, that’s right. Trixie’s will throw a steak on the grill and draw you an ice cold beer. It’s rustic, I can tell you. But it’s always fun to drop by after a day in the mountains. Afterward we headed home in the dark, tired, but smiling. It was the end of a perfect day. The next day I went back to work promoting AGAINST THE SUN, big Jake Cantrell and Sage Dumont’s story, which deals with a visit to Texas by a Saudi Arabian sheik and his family, The sheik is there to negotiate a three hundred million dollar oil-well equipment deal. Jake is hired to act as Sage’s bodyguard and teach her the protocols she will need to know in order to complete the transaction. Customs like not showing the bottom of her foot, which is considered an insult, or making the okay sign, which is giving someone the evil eye. Because of the research involved in getting the customs, clothing, and attitudes of the Saudi visitors correct, AGAINST THE SUN was one of the most difficult books I’ve ever tackled. I’m proud of the way it turned out. I hope you’ll look for AGAINST THE SUN and that you enjoy it. Love to hear what your perfect day would be. I hope you’ll try AGAINST THE SUN and that you enjoy it. Kat is graciously awarding a copy of AGAINST THE SUN to one lucky commenter. Print copies are eligible for US and CANADA postal addresses only. Giveaway ends 9pm EST May 30th. Please supply your email in the post. You may use spaces or full text for security. (ex. jsmith at gmail dot com) If you do not wish to supply your email, or have trouble posting, please email maureen@justromanticsuspense.com with a subject title of JRS GIVEAWAY to be entered in the current giveaway. Kay, it must be so hard to focus on writing living someplace as scenic as you do! My ideal writing day would be a warm spring day...nobody home but ME, and I throw open the windows and let the soft breeze carry the scent of honeysuckle inside. I scribble away on my notepad-uninterrupted! a perfect day would be to lay around and read your book this sounds like another great read thanks for the chance at winning one tammy. A happy day would be spent with my family and friends. Of course, I suspect winning a book from you would also make a perfect day. I sure would love to find out. Good morning! Love you all for your wonderful comments about my books. Interesting to read other people's perfect day. Love the one about opening the windows and letting in the honeysucklel. Up here, we have closed windows much of the year, but beautiful views. My perfect day would involve going to my favorite museum. I would have a meal at my favorite restaurant and then read. It sounds like you have a lot of fun, coupled with extensive research. My perfect day would be writing in the morning & editing in the afternoon & reading in the evening! Please enter me in your draw. I am very interested in reading your work. Congratulations on the book! A perfect day would be sightseeing in another country. Congrats on your new release! Against the Sun was magically downloaded on my Kindle while I slept last night :) My perfect day involves relaxing on a beach with my Kindle and an umbrella drink. Happy Release Day, Kat. The perfect day would start with me waking up late and having brunch and maybe catching a movie or shopping with my family and friends. I haven't read any of your books yet, but checked out your website and it appears you have a few (ha ha). Any suggestions on which one to start with? The day you mentioned would be my Husband's perfect day for sure. We have lived our entire lives in Central Illinois, so not much to see except corn and farm animals. He and I did get to take a trip out to Portland last year and it was wonderful. The temp was perfect and we did a lot of hiking to waterfalls. I would say anything that has to do with the outdoors and is relaxing (a beach or a leisurely hike) would be a perfect day for me. Congrats on the book! Any day off work is a great day. To make it absolutely perfect I would sleep in late, have a great breakfast, play a little tennis, read on a sunny day in my backyard *sigh* perfect. Your day sounds wonderful and the book sounds like a good one. My perfect day... lounging around and reading as many books as I want... or spending a day at an amusement park and having to not wait on any lines for the rides I want to go on! ;) Thanks for sharing & congrats on this latest release! I would love to have a day like yours, with the beautiful scenery!! I can't wait to read this book, I love all your books. Thanks for sharing your perfect day. Love the comments. Martha, thanks so much, Lynda--love the dream. I'm always too hot or too cold when I sit outside. Amy...you might want to start with Against the Wind, the first in the series. Jackson Raines is a modern day cowboy hunk. all are stand alone, so you can pick and choose.